Hi guys i would like to know for anybody who is a new grade nurse or who has experience, have you ever been assigned to a patient with a condition or disease process that you did not go over in school? we are thought a lot but cannot be thought everything and certain diseases do not get tested on as much as others. Of course every nurse has been assigned a patient with an unfamiliar diagnosis- that is why life-long learning is so critical. During my new grad days, I had a patient with ornithase trans-carbamylase deficiency. Neither I, the charge nurse, the most experienced nurse in the NICU nor any of the doctors had ever seen it. Fast-forward 40 years of practice and I still hear of new conditions and diseases. This will happen a lot in your career- you just keep learning. Every. Single. day. RNNPICU has 13 years experience. Every congenital and genetic disorder I deal with daily in the NICU was never taught in nursing school. You look them up or ask your preceptor. And you critically think to determine interventions and assessments once you understand the physiology and treatment. PS: The word is 'you'. Of course, this literally happens all the time in pediatrics. There are so many syndromes and diseases that are so rare that most nurses will ever encounter them. Moyamoya Disease is something I never heard of in school and something many health professionals will never encounter in their career. Actually, recently I mentioned it at one of my team's weekly meetings and none of my colleagues, including one very experienced Pediatric NP, had ever heard of it. I would hazard to guess that the floor I worked on saw the most of this disease of anywhere in the country and maybe the world. We literally got patients that came to us from all over the world for the surgery that one of our Neurosurgeons had pioneered. Many of the syndromes and disorders were completely foreign to me as a new hire, but are common and I became quickly familiar with them. There are others that I see once every couple years or once in a career. If you are admitting the baby, then when you get time, you do an internet search and print out the information for the next nurse(s). There may be things that you may see once in a career. We got a set of conjoined twins shortly after I started. The previous set was 7-8 yrs prior to them. Ironically, we got another set a year later. I may go another 10-15 yrs before seeing another set. In the inpatient setting, your providers (especially specialists) are a great resource. Don't be afraid to pick their brain. They want you to know what to look for to avoid any acute exacerbation from going unnoticed and untreated. 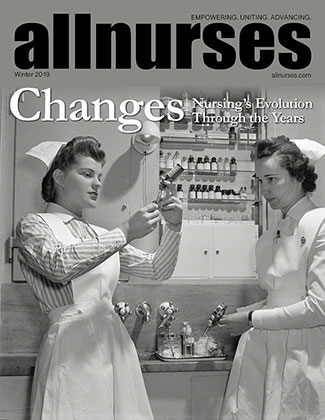 Don't be afraid to ask questions to your charge nurses, physicians and nurse practitioners. Look at the specialist notes to see what is important enough for them to be noting it in their charting. Some docs are really good about explaining their treatment plans, what they're watching for, etc in their notes. Hospitals tend to recommend resources (i.e. Lexicomp, Lippencott) that might be built into the EMR or the hospital website. I'm a big fan of UpToDate.com but if your facility doesn't subscribe to it, it's pretty expensive. For the basic concepts of the disease you can use something like MayoClinic.com or WebMD.com. It will not necessarily be a thorough guide but it will help you learn more about the diagnosis so you can understand cause, symptoms, treatments and know how to explain information to the patient. I've taken care of patients with diagnosis that have only been described a handful of times in medicine. You read. Fortunately, once you get some background information, a lot of nursing interventions are the same... so you're never (in my experience) starting from square one.